ABIGAIL ADAMS wrote the following letter to her niece Elizabeth Cranch, whom she calls Betsy, during the Adams’s stay in France in 1785. She describes visits to the residence of the Swedish Ambassador and to a French aristocrat, including details of the furnishings and dress she knew her niece would find interesting. John and Abigail would shortly proceed to London where John Adams would be minister plenipotentiary to the Court of St. James’s. May 12th. 1785 AuteuilDid you ever my dear Betsy see a person in real Life such as your imagination form’d of Sir Charles Grandison*? The Baron de Stael the Sweedish Ambassador comes nearest to that Character in his Manners and personal appearence of any Gentleman I ever saw. The first time I saw him I was prejudic’d in his favour, for his countanance Commands your good opinion, it is animated intelligent sensible affable, and without being perfectly Beautifull, is most perfectly agreeable. Add to this a fine figure, and who can fail from being Charmed with the Baron de Stael? He lives in a Grand Hotel, and his suite of apartments his furniture and his table are the most Elegant of any thing I have seen. Altho you dine upon plate in every noble House in France, I cannot say that you may see your face in it, but here the whole furniture of the table was burnished and shone with Royal Splendor. Seventy thousand Livres in plate will make no small figure, and that is what his Majesty gave him. The desert was servd in the richest China with knives, forks, and spoons of Gold. As you enter his apartments you pass through files of servants into his antichamber, in which is a Throne coverd with green velvet upon which is a Chair of State over which hangs the picture of his Royal Master. These thrones are common to all Ambassadors of the first order as they are the immediate representatives of the king. Through his antichamber you pass into the grand Saloon which is elegantly adornd with architecture, a Beautifull Lusture hanging from the middle. Settees Chairs and hangings of the richest Silk embroiderd with Gold, Marble Slabs upon fluted pillars round which wreaths of artificial flowers in Gold entwine. It is usual to find in all houses of fashion, as in this, several dozen of Chairs, all of which has stuft backs and cushings standing in double rows round the rooms. The dinning room was equally beautifull, being hung with Gobelin tapestry the coulours and figures of which resembled the most elegant painting. In this room were hair bottom mahogony back chairs and the first I have seen since I came to France, two small statues of a venus de Medicis and a venus de bel . . . were upon the Mantle peice, the latter however was the modestest of the kind, having something like a lose robe thrown partly over her. From the Sweedish Ambassadors we went to visit the Dutchess of D’Anville, who is Mother to the Duke de Rouchfoucault. * We found the old Lady sitting in an Easy chair, around her set a circle of Academicians and by her side a young Lady. Your uncle presented us, and the old Lady rose and as usual gave us a Salute. . . . The dutchess is near 80, very tall and lean. She was drest in a silk chimise with very large sleaves comeing half way down her arm, a large cape, no stays a black velvet Girdle round her waist. Some very rich lace in her chimise round her neck and in her sleaves, but the lace was not sufficient to cover the upper part of her neck which old time had harrow’d. She had no cap on, but a little black gauze Bonet which did not reach her Ears and tied under her chin, her venerable white hair in full view. The dress of old women and young girls in this Country is detestable to speak in the French stile. The latter at the age of Seven being cloathed exactly like a woman of 20 and the former have such a fantastical appearance that I cannot endure it. The old Lady has all the vivacity of a Young one. She is the most learned woman in France. Her house is the resort of all Men of literature with whom she converses upon the most abstruse subjects. She is [of] one of the most ancient as well as richest families in the kingdom. . . . Thus you have my yesterdays entertainment. The only pleasure which I shall feel to day, is that which I have taken in writing you this morning. I forgot to mention to you that several persons of high rank dined with us yesterday, but not one of them can claim a stroke of my pen after the Baron de Stael. * Abigail is referring to the character in an epistolary novel by Samuel Richardson first published in 1753 that both she and her niece would have read. ** The Duchess’s son, Louis Alexandre, Duc de La Rochefoucauld, was a leading philosophe and friend of America with a keen interest in American state constitutions. He was killed by a Revolutionary mob in 1792. 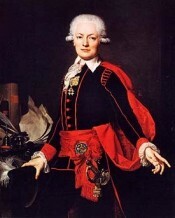 The Baron de Stael married the daughter of the French Minister of Finance Jacques Necker, Anne Louise Germaine Necker, who was to achieve fame as “Madame de Staël”. His portrait by the Swedish painter Adolph-Ulrich Wertmüller shows him at the age of thirty three. The letter can be found at the Massachusetts Historical Society; see this LINK.